If you walked into your bathroom one morning and noticed a bunch of mold growing on the wall over your bathtub, you'd probably grab a bit of bleach and a rag to get rid of it, right? Mold is usually a sign that your home needs a serious cleaning session, but a family in Texas recently took the growth as something else entirely. According to CBS Houston, residents in Splendora, Texas, were thrilled to discover the likeness of Jesus Christ inside their moldy shower, taking the image as a sign that their home is blessed. "He’s just watching over us to make sure nothing wrong happens or I get in trouble and go back," Thomas George, one of the household members who recently got out of jail, told ABC13 News. "It gives me inspiration just to do better." The Huffington Post reports that the mold began growing while George was serving time, and since its appearance there has supposedly been changes in the condition of one of the home's residents, a woman who was diagnosed with HIV. The family claims that her health has improved with the arrival of Jesus' image in the shower stall. However, a Northwestern University study last year found that human beings tend to look for signs of familiarity and meaning in abstract images, turning random squiggles into things like faces, animals or other pictures that represent something from their lives. The Huffington Post points out that this may be the case, seeing as one neighbor believes the shower stall Jesus actually looks like him. So if it's not divine intervention, what is causing bathroom mold? According to the Georgia Department of Human Resources, mold is a type of fungus that naturally occurs in the environment. Molds make spores to reproduce, and these spores often make their way inside homes on your clothing or in the air coming through windows. 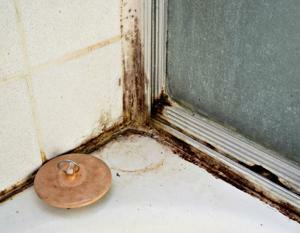 Mold needs certain conditions to survive, like moist, dark surfaces and plentiful food sources. The bathroom is a prime place for mold to thrive because it's usually humid and grime and dirt is available for food, reports the source. To make sure that mold isn't running amok in your bathroom (unless, of course, you'd like to see if Jesus will appear in your shower stall, too), keep your bathroom well-ventilated and dry damp surfaces as much as possible. Use a shower spray on a daily basis to keep soap scum and dirt at bay, and use a cleaning product with bleach if you ever notice mold growing.